The Key Step Gymnastics competition resource has been put together in response to numerous requests for a competition framework for ‘grass-roots' development in Primary schools. 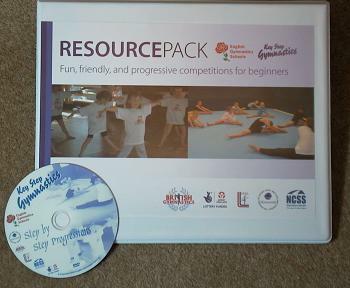 Although it is designed as a toolkit for Partnerships the Key Step pack is suitable for use in individual schools, leisure centres, gymnastic clubs and district/county associations. Although the pack is foremostly a competition resource, teachers report that information from the pack e.g. example routines, the supporting DVD and advice about individual skills progressions, has helped to enhance curricular PE lessons. There are 3 gymnastic areas, known as ‘disciplines' in Key Step. These are floor, vault and body management. For each ‘discipline' there are 3 levels of routines (explained below). 0845 1297 129 option 4 - British Gymnastics, Ford Hall, Lilleshall National Sports Centre, Newport, Shropshire, TF10 9NB. If you wish to reduce the time it would take to run a festival it is possible to incorporate just the Body Management routines alongside the Vault, or the Floor Skills routine with the vault for competition at KS1. The course is suitable for candidates aged 13yrs+ and is an excellent option for young leaders and young volunteers. It is estimated that between thirty and forty five thousand children in England took part in the 460 Key Step competitions and festivals in the 2009/10 academic year. Many children will have been involved in more than one event if they were able to follow the pathway to Level 3 (See pathway diagram below). The challenge now must be to sustain and develop the competition framework to ensure a significant number of these young people can perform at the next level. For floor and vault gymnastics this opportunity is already available through the British Schools Gymnastics Association (BSGA) competition programme. It represents very simple progression from Key Step 3. A full 12 metre floor area is used for the competition. In order to practice without a full floor area, you can measure space available in your own gym/hall and then set out mats in appropriate locations to perform the agilities. You also need a vaulting box at least 1 metre high, a springboard and suitable mats for a landing surface. Usually teams compete in their region with the winners of each section qualifying for the National finals. It is still possible in some regions and in Scotland, Northern Ireland and Wales, (in some age groups), to go direct to the National final.